Celebrate Mother's in May | Your Life Security, L.L.C. Mothers are special persons in our lives. They make sacrifices to ensure our happiness and unselfishly take care of us when we are sick. And the odds are very good that it’s mom who you will be caring for as time goes by. Across the industrialized world, women still live 5 to 10 years longer than men. Among people over 100 years old, 85% are women. Many of us hold on to an idyllic vision of the golden years, imagining our parents will always be in good health and living self-sufficiently in their own home. But that scenario is likely to get dashed. On average, nearly 70% of 65-year-olds will eventually need some form of long-term care, according to the U.S. Department of Health & Human Services. And HHS estimates that 20% will need it for more than five years. Whether that means round-the-clock supervision or a caregiver dropping by your home to help you with personal care and other tasks, it pays to prepare financially well before you retire. Not enough people have some plan in place. For many seniors, it’s a lot of self-funding and relying on family members and Medicaid. 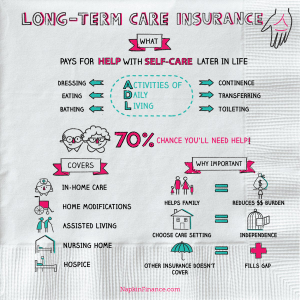 Napkin Finance image – Here are some things to consider when preparing for the possible financial burden for basic living-activities and assistance referred to Extended Care or Long-Term Care (LTC). 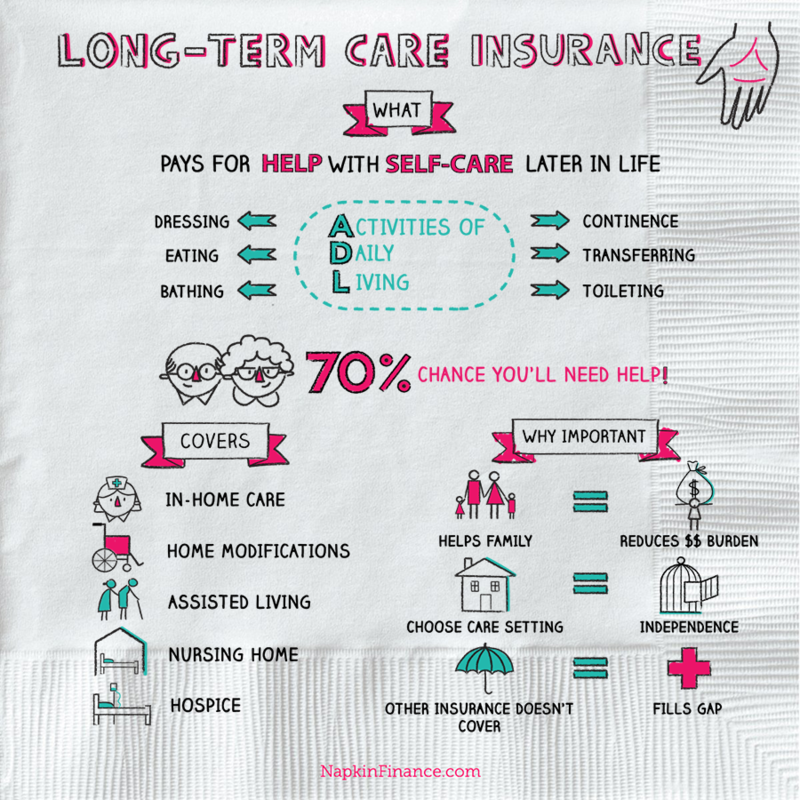 What constitutes long-term care can vary widely. It’s generally defined as the services someone may need to handle their basic, daily activities, or rehabilitation that extends beyond 90 days. Such services are typically provided in one of three settings: at an assisted-living facility, at home with the aid of a caregiver, or in a nursing home. However, it is important to know the financial setup for each option. For instance, assisted-living facilities generally don’t accept Medicare and Medicaid. Nursing homes generally have the broadest range of services, including 24-hour supervision. They are primarily paid for by Medicare, but Medicaid can also by those who meet annual income limits. A private room in a nursing home cost an average $6,965 per month in 2010, according to HHS. A semiprivate room ran about $6,235 per month. By comparison, a month of care in a one-bedroom apartment at an assisted-living facility cost an average $3,293 per month. In most states, the asset limit is about $2,000 for an individual and $3,000 for a couple that’s living together. That has long-inspired retirees in need of long-term care to spend down or give away their assets, so they can qualify for Medicaid. But the government will look at applicants’ finances going back five years and factor in all assets. Still, in some states, it’s possible to buy long-term care insurance and the government will let you reduce your assets as you try to qualify for Medicaid by the amount of insurance you purchased. So, if you bought $200,000 of insurance, you can effectively retain $200,000 in assets and still qualify for Medicaid. 2. Relying on Medicaid and perhaps, a very limited source from Medicare. While you are healthy and active, that is the time to pursue long-term care insurance which, reimburses policyholders a set amount to cover extended care costs in the home or Senior Care community. Obtaining long term care insurance can alleviate the draining of assets and provide increased financial stability. In order to qualify for long-term care insurance, you must be insurable, which means that you do not have a pre-existing health condition that would prevent the insurance company from providing you with insurance. There are many varied options to consider that incorporate life insurance, asset-care as well as utilizing qualified funds (401K, 403B….) to develop a long-term care benefit plan, too. Early – Mid 50s is probably the sweet spot for people, because there are a lot of people still eligible for long-term care insurance. What happens in your 60s and 70s is people start worrying about this and they become uninsurable due to health changes. So, during this Mother’s Day month, sit down with Mom and the rest of the family, to make sure her “golden years” are priceless as well as your future well-being. Call us at Your Life Security, after you call your mother.